Some of your appointments require time before or after you meet with your customer to set up, clean up, or reset your room and equipment. Or if you’re on the road a lot between customer appointments you may need time to ensure you and your team can get from point A to point B without making the customer wait. Regardless of the reason, this time is critical for you and your staff to be able to run your business safely, efficiently and effectively. 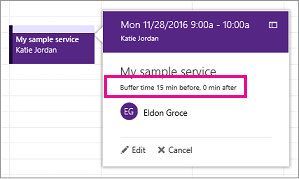 “Buffer time” is a new feature in Microsoft Bookings that gives you this extra time. You can set buffer time before appointments start, after appointments end, or both to give you and your staff time to deliver great service to your customers. Note: Bookings is turned on by default for customers who have the Office 365 Business Premium, or Office 365 A3 and Office 365 A5 subscriptions. Bookings is also available to customers who have Office 365 Enterprise E3 and E5, but it is turned off by default. To turn it on, see Get access to the Office 365 business apps for enterprise subscriptions. 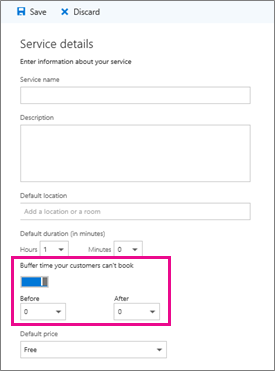 Buffer time defaults are set on the Service details page in Bookings. Like all service defaults set on this page, these are the settings that drive your customers’ experience when they book with you using your online booking page. They also set the defaults that you will see when you create a new booking manually from within Bookings on the Bookings iOS or Android mobile apps. These defaults can be edited by you for a specific booking to meet specific customer needs. The buffer time setting can be found just below the “Default duration” pickers on the Service details page. Before it can be set for a given service, Buffer time needs to be turned-on. This is done by clicking the Buffer time toggle which will then expose “Before” and “After” drop-downs. These drop-downs are used to pick the default amount of time to hold before and after each booking (see below). To avoid confusion about when customers expect to meet with you, Bookings shows buffer time and actual appointment time (the time your customers expect to meet with you) on your calendar, and in email confirmations and reminders to relevant staff. For example, below is what you’d see in Bookings for an appointment with a customer that includes 15-minutes of pre-appointment buffer time. Note that the event itself (on the left in the image below) shows lighter shading for the buffer time and darker shading for the actual customer appointment. While the appointment call-out (opened with a single click on the event) specifically states that the appointment is from 9:00a to 10:00a with Katie Jordan, and includes 15 minutes of buffer time before the appointment and 0 minutes after the appointment. Confirmations and reminders to staff similarly reference specific buffer and appointment timing while the customer would only get confirmations and reminders that reference a 9:00a – 10:00a appointment time. Your customers don’t directly see the buffer times you set, nor can they change them, but because buffer time is used to calculate overall service duration, customers will see you and your relevant staff as booked during both buffer and regular appointment times. Similarly, customers only see availability for you and your staff that accommodates services including their associated buffer times. Put another way, a one-hour long service with a 15-minute pre-appointment buffer time (to prep a room, for example) would require an available time block of at least 1-hour and 15-minutes. An appointment for this service would therefore fill a 75-minute block of time on your calendar and therefore need 75-minutes of availability to book without conflict.